For other uses, see Buffet (disambiguation). For the furniture of the same name, see Sideboard. A buffet (UK: /ˈbʊfeɪ/, US: /bəˈfeɪ/, from French: sideboard) is a system of serving meals in which food is placed in a public area where the diners serve themselves. A form of service à la française, buffets are offered at various places including hotels, restaurants, and many social events. Buffet restaurants normally offer all-you-can-eat food for a set price, but some measure prices by weight or by number of dishes. Buffets usually have some hot dishes, so the term cold buffet (see Smörgåsbord) has been developed to describe formats lacking hot food. Hot or cold buffets usually involve dishware and utensils, but a finger buffet is an array of foods that are designed to be small and easily consumed only by hand, such as cupcakes, slices of pizza, foods on cocktail sticks, etc. The essential feature of the various buffet formats is that the diners can directly view the food and immediately select which dishes they wish to consume, and usually also can decide how much food they take. Buffets are effective for serving large numbers of people at once, and are often seen in institutional settings, such as business conventions or large parties. Since a buffet involves diners serving themselves, it has in the past been considered an informal form of dining, less formal than table service. In recent years, however, buffet meals are increasingly popular among hosts of home dinner parties, especially in homes where limited space complicates the serving of individual table places. The buffet table originates from the brännvinsbord (Swedish schnapps, or shot of alcoholic beverage) table from the middle of 16th century. This custom had its prime during the early 18th century, and was developed into the more modern buffet around the beginning of 19th century. The smörgåsbord buffet did not increase in popularity until the expansion of the railroads throughout Europe. The smörgåsbord table was originally a meal where guests gathered before dinner for a pre-dinner drink, and was not part of the formal dinner that followed. The smörgåsbord buffet was often held in separate rooms for men and women before the dinner was served. Smörgåsbord became internationally known as "smorgasbord" at the 1939 New York World's Fair exhibition, as the Swedes had to invent a new way of showcasing the best of Swedish food to large numbers of visitors. The term buffet originally referred to the French sideboard furniture where the food was served, but eventually became applied to the serving format. The word "buffet" became popular in the English-speaking world in the second half of the 20th century after the Swedes had popularized the "smorgasbord" in New York. The word is now fully accepted into the English language. While the possession of gold and silver has been a measure of solvency of a regime, the display of it, in the form of plates and vessels, is more a political act and a gesture of conspicuous consumption. The 16th-century French term buffet applied both to the display itself and to the furniture on which it was mounted, often draped with rich textiles, but more often as the century advanced the word described an elaborately carved cupboard surmounted by tiers of shelves. In England such a buffet was called a court cupboard. Prodigal displays of plate were probably first revived at the fashionable court of Burgundy and adopted in France. The Baroque displays of silver and gold that were affected by Louis XIV of France were immortalized in paintings by Alexandre-François Desportes and others, before Louis' plate and his silver furniture had to be sent to the mint to pay for the wars at the end of his reign. During the 18th century more subtle demonstrations of wealth were preferred. The buffet was revived in England and France at the end of the century, when new ideals of privacy made a modicum of self-service at breakfast-time appealing, even among those who could have had a footman servant behind each chair. In The Cabinet Dictionary of 1803, Thomas Sheraton presented a neoclassical design and observed that "a buffet may, with some propriety, be restored to modern use, and prove ornamental to a modern breakfast-room, answering as the china cabinet/repository of a tea equipage". The concept of eating a buffet arose in mid 17th century France, when gentleman callers would arrive at the homes of ladies they wanted to woo unexpectedly. Their surprise arrival would throw the kitchen staff into a panic and the only food that could be served was a selection of what was found in the cold room. The knife is tabooed at the "buffet" lunch, hence all the food must be such as can be eaten with fork or spoon. As a rule, friends of the hostess serve... The following dishes cover the essentials of a "buffet" luncheon. Beverages: punch, coffee, chocolate (poured from urn, or filled cups brought from pantry on tray); hot entrées of various sorts (served from chafing dish or platter) preceded by hot bouillon; cold entrées, salads, lobster, potatoes, chicken, shrimp, with heavy dressings; hot rolls, wafer-cut sandwiches (lettuce, tomato, deviled ham, etc. ); small cakes, frozen creams and ices. The informal luncheon at small tables calls for service by a number of maids, hence the "buffet" plan is preferable. There are many different ways of offering diners a selection of foods that are called "buffet" style meals. 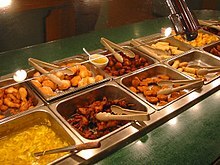 Some buffets are "single pass only", but most buffets allow a diner to first take small samples of unfamiliar foods, and then to return for more servings if desired. To avoid misunderstandings in commercial eating establishments, the rules and charges are often posted on signs near the buffet serving tables. One form of buffet is to have a display counter or table filled with plates containing fixed portions of food; customers select plates containing whichever dishes they want as they walk along. The food display may either be staffed, or the customers may pick up the food plates themselves. This form is most commonly seen in cafeterias. Another derivative of this type of buffet occurs where patrons choose food from a buffet style layout and then pay based on what was chosen (sometimes based on the weight of the food, or color-coded plates). A variation occurs in a dim sum house, where seated patrons make their selections from wheeled carts containing different plates of food which the staff circulate through the restaurant. Another variation is a conveyor belt sushi restaurant, where seated patrons select dishes from a continuously-moving conveyor belt carrying a variety of foods. In another variation, Brazilian rodízio style buffets feature roving waiters serving churrascaria barbecued meats from large skewers directly onto the seated diners' plates. The "all-you-can-eat" buffet is more free-form; customers pay a fixed fee and then can help themselves to as much food as they wish to eat in a single meal. This form is found often in restaurants, especially in hotels. In some countries, this format is popular for "Sunday brunch" buffets. A so-called Mongolian barbecue buffet format allows diners to collect various thinly-sliced raw foods and add flavorings, which are then stir-fried on a large griddle by a restaurant cook. Some hot pot restaurants offer all-you-can-eat buffets, in which diners order plates of thinly-sliced raw foods and flavorings, and cook them in boiling pots of soup at their tables. A salad bar is commonly offered in delicatessens and supermarkets, in which customers help themselves to lettuce and other salad ingredients, then pay by weight. Sometimes only cold foods are offered, but often warmed or hot foods are available at a "hot foods bar", possibly at a different price by weight. Open buffets are often associated with a celebration of some sort, and there may be no explicit charge or the cost may be included in an admission fee to the entire event. Art show openings at galleries and museums are often accompanied by a modest buffet for invited guests. As a compromise between self-service and full table service, a staffed buffet may be offered: diners carry their own plate or tray along the buffet line and are given a portion by a server at each station, which may be selected or skipped by the diner. This method is prevalent at catered meetings where diners are not paying specifically for their meal. Alternatively, diners may serve themselves for most prepared selections, but a carvery station for roasted meats is staffed. Some buffet formats also feature staffed stations where crepes, omelettes, noodle soups, barbecued meats, or sushi are custom prepared at the request of individual diners. At midnight every self-respecting casino premières its buffet—the eighth wonder of the world, the one true art form this androgynous harlot of cities has delivered herself of.... We marvel at the Great Pyramids, but they were built over decades; the midnight buffet is built daily. Crushed-ice castles and grottoes chill the shrimp and lobster. Sculptured aspic is scrolled with Paisley arabesques. They are, laid out with reverent artistry: hors d'oeuvres, relish, salads, and sauces; crab, herring oyster, sturgeon, octopus, and salmon; turkey, ham, roast beef, casseroles, fondues, and curries; cheeses, fruits and pastries. How many times you go through the line is a private matter between you and your capacity, and then between your capacity and the chef's evil eye. Many boarding schools, colleges, and universities offer optional or mandatory "meal plans", especially in connection with dormitories for students. These are often in an "all-you-can-eat" buffet format, sometimes called "all-you-care-to-eat" to encourage dietary moderation. The format may also be used in other institutional settings, such as military bases, large factories, cruise ships, or medium-security prisons. In 2007, the first all-you-can-eat seating section in Major League Baseball was introduced at Dodger Stadium. The trend spread to 19 of the 30 major league parks by 2010, and numerous minor league parks by 2012. The basic menu includes traditional ballpark food such as hot dogs, nachos, peanuts, popcorn, and soft drinks. In 2008 all-you-can-eat seats were also inaugurated in numerous NBA and NHL arenas. A 2011 study showed that the actual amount of food consumed increases with the price charged for the buffet. There are a few formal and informal rules for safe and courteous dining at buffets. Especially if repeat visits to the serving stations are permitted, diners are expected not to take too much food at one time, to avoid unnecessary food waste. Diners should not re-use plates and utensils when getting additional servings, and observe basic food hygiene rules. In Australia, buffet chains such as Sizzler serve a large number of patrons with carvery meats, seafood, salads and desserts. Cruise operators in Sydney like Australian Cruise Group and Captain Cook, conduct Sydney Harbour sightseeing cruises with continental buffets having multiple seafood options. Buffets are also common in Returned and Services League of Australia (RSL) clubs and some motel restaurants. In Brazil, comida a quilo or comida por quilo — literally, "food by [the] kilo" — restaurants are common. This is a cafeteria style buffet in which diners are billed by the weight of the food selected, excluding the weight of the plate. Brazilian cuisine's rodízio style is all-you-can-eat, having both non-self-service and self-service variations. In Sweden, a traditional form of buffet is the smörgåsbord, which literally means "table of sandwiches". In the US, there are numerous Chinese-American cuisine-inspired buffet restaurants, as well as those serving primarily traditional American fare. Also, South Asian cuisine, pan-Asian cuisine, and Mediterranean cuisine are increasingly available in the buffet format, and sushi has also become more popular at buffets. In some regions of the US, Brazilian-style churrascaria barbecue buffets served rodízio style are becoming popular. Las Vegas and Atlantic City are famous for all-you-can-eat buffets with a very wide range of foods on offer (similar ones have also become common in casinos elsewhere in the US). 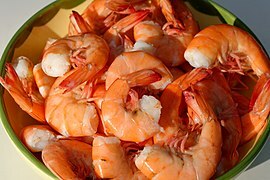 Shrimp and other seafood are commonly featured in buffets. ^ "Buffet". The Free Dictionary By Farlex. Retrieved 19 May 2012. ^ "Christmas Celebrations Etiquette"[permanent dead link] (Swedish). Etikett Doktorn. Accessed June 2011. ^ sv:brännvinsbord "Brandy Bordet" (Swedish Wikipedia article). Accessed June 2011. ^ a b Tonon, Rafael (6 October 2016). "How the Brazilian Steakhouse Chain Fogo de Chão Swept America". Eater. Vox Media Inc. Retrieved 2019-04-04. ^ "Strip visionary McDonald dies". Las Vegas Sun. July 9, 2002. ^ Lam, Bourree. "All You Can Eatonomics". Lucky Peach. Archived from the original on 13 April 2015. Retrieved 14 April 2015. ^ a b Tiffany, Kaitlyn (3 April 2019). "When did America's heart turn cold on buffet chains?". Vox. Vox Media Inc. Retrieved 2019-04-04. ^ Associated Press (27 May 2007). "Dodger Stadium's All-You-Can-Eat Seats Are a Popular Draw". Retrieved 9 July 2014. ^ "Growing Trend: All-you-can-eat sections at big-league parks". Sports Illustrated. 20 July 2010. Retrieved 14 July 2014. ^ Williams, Doug (11 June 2012). "All-you-can-eat sections sweep baseball". ESPN. Retrieved 9 July 2012. ^ McCarthy, Michael (7 March 2008). "Eating Away the Innings in Baseball's Cheap Seats". USA Today. Retrieved 17 July 2014. ^ Carman, Tim (1 May 2012). "Where the empty calories just keep on coming". The Washington Post. Retrieved 15 July 2014. ^ Associated Press (21 March 2008). "Baseball Fans Get Never-Ending Ballpark Buffet, Much to the Dismay of Nutritionists". Archived from the original on 11 August 2014. Retrieved 20 July 2014. ^ Just, David R.; Brian Wansink (February 2011). "The Flat-Rate Pricing Paradox: Conflicting Effects of "All-You-Can-Eat" Buffet Pricing". The Review of Economics and Statistics. 93 (1): 193–200. doi:10.1162/REST_a_00057. Retrieved 27 February 2014. ^ a b c Filloon, Whitney (15 October 2018). "How to Get Your Money's Worth at All-You-Can-Eat Buffets". Eater. Vox Media Inc. Retrieved 2019-04-04. ^ a b Newman, Jacqueline M. "Chinese Buffets: A Trend Worth Exploring". Flavor & Fortune. ISACC. Archived from the original on 26 October 2013. Retrieved 1 June 2014. ^ "Buffetmovie.com". Buffetmovie.com. Retrieved 24 September 2013. Peck, Carole; et al. (1997). The buffet book : inspired ideas for new-style entertaining, with 175 recipes. Viking. ISBN 0-670-86516-8. Novel Touches for Buffet Service. Popular Mechanics. August 1945. Retrieved 25 December 2011. Von Welanetz Wentworth, Diana (1978). The Art of Buffet Entertaining. J. P. Tarcher. ISBN 0-87477-080-7. Look up buffet in Wiktionary, the free dictionary. Wikimedia Commons has media related to Buffets.